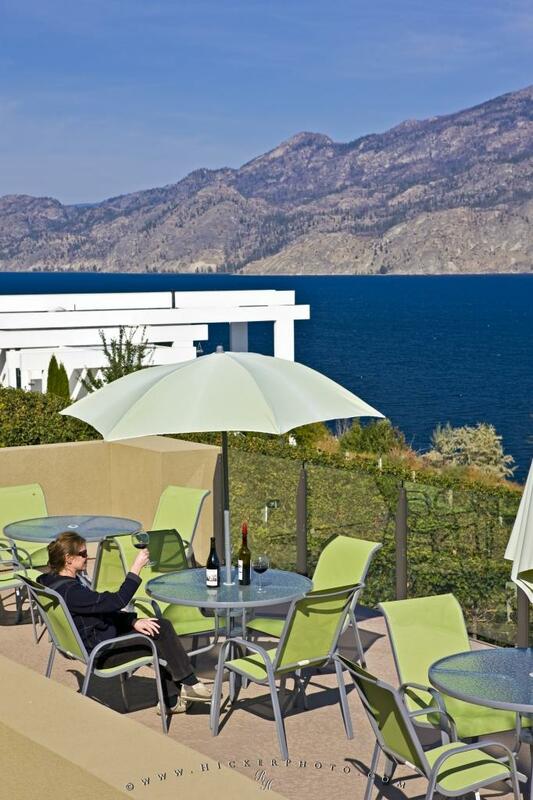 A woman enjoys the scenic views over Okanagan Lake while wine tasting at Bonitas Winery in Summerland, BC, Canada. A trip to Bonitas Winery wouldn't be complete without a spot of wine tasting. Sitting amongst the rows of grapevines overlooking Okanagan Lake with its scenic shores, Bonitas Winery is a must stop while touring through the Okanagan Valley. Woman sitting at a table on the terrace with a bottle of wine at Bonitas Winery, Summerland, Okanagan-Similkameen Region, Okanagan, British Columbia, Canada.